Born in Newport News, Virginia in 1917, Ella Fitzgerald, “The First Lady of Song” is one of the most influential jazz voices in history. She made her singing debut at Harlem’s Apollo Theater on one of its Amateur Nights, at which she won first prize. 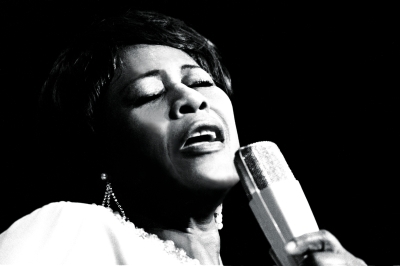 Her career grew exponentially from that point, and she became one of the leading voices of jazz. With a range spanning three octaves, a purity of tone rivaled by no other singer, faultless phrasing and interpretation and a horn-like improvisational ability, Ella is as close to perfection as any singer could be. Over her nearly sixty-year recording career lasting until her death in 1996, she won thirteen Grammy Awards, and was awarded the National Medal of Art and the Presidential Medal of Freedom. Her recordings have inspired and influenced perhaps every jazz singer, if not every jazz musician since. Imitations and emulations are heard on the voices of nearly every aspiring female jazz vocalist. Ms. Fitzgerald sang up until her death. Ms. Fitzgerald was an “honorary inductee” into the Oklahoma Jazz Hall of Fame in 1997. More about Ella Fitzgerald on Wikipedia! Click here to view Ella Fitzgerald's discography on Wikipedia.